The Martin Luther King Jr. Memorial is located on the northwest edge of the Tidal Basin on the National Mall, among the Japanese Gardens in Washington, D.C.. The memorial’s address of 1964 Independence Way is in reference to the year, 1964, in which the Civil Rights Act became law. As with all the park memorials, it is open to the public 24 hours a day. Dr. Martin Luther King Jr. (1929–1968) was a pastor from the segregated south in Montgomery, Alabama. In 1954, he joined the leadership of the National Association for the Advancement of Colored People, (NAACP) and was the architect of non-violent, peaceful protests, which resulted in the integration of the Montgomery’s buses and birthed a movement for equality across the nation. Dr. King was a leader in the movement for desegregation, voting rights, and equality. He won the Nobel Peace Prize in 1964 for combating racial injustice through non-violent means. He was best known for his encouragement of non-violent means of protest, based on his Christian beliefs. He was assassinated in 1968 and posthumously awarded both the Congressional Gold Medal and the Presidential Medal of Freedom. 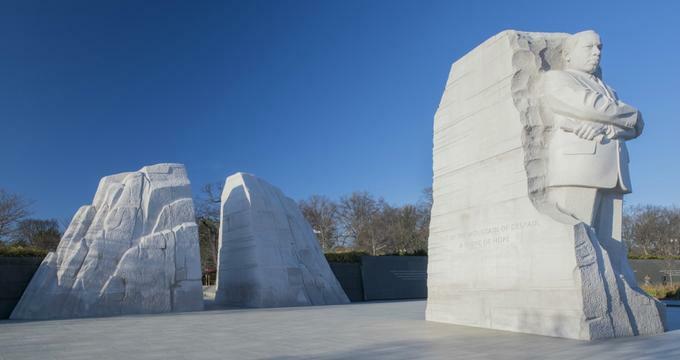 The memorial’s design of Dr. King emerging from a mountain made of pink granite is in reference to a line from King’s famous 1963 I have a Dream speech. This “stone of hope,” which is pulled from the “mountain of despair,” pays homage to a quote from his speech in which faith is the driver that pulls the stone of hope from the mountain of despair. Visitors enter the memorial through a cut-out in the mountain of despair, and see King emerging from the stone of hope, gazing towards the horizon. A wall of quotes lines the periphery of the memorial. The quotes represent key moments in Dr. King’s Civil Rights struggle. Although the quotes acknowledge that the struggle for equality continues to this day, they showcase the principals of democracy, justice, peace, and love that Dr. King stood for. The Martin Luther King Jr. memorial is the first on the National Mall dedicated to a citizen who was neither a president nor a war hero. History: In 1996, at the urging of Dr. King’s fraternity, Alpha Phi Alpha, Congress approved the establishment of a memorial to him. Over 900 entrants responded to the call for designs. In 2000, the ROMA Design Group won the bid with its design of Dr. King emerging from a mountain. His portrait was carved by Master Lei Yixin, who worked closely with photographs and with Dr. King’s family to create the 30-foot-tall likeness. The words engraved on the memorial were done over a span of two years by third-generation stone carver Nick Benson. Benson also contributed to the World War II Memorial at the park. The placement of the memorial is nearby the Lincoln Memorial, where Dr. King gave his pivotal 1963 speech. Its proximity to the Lincoln steps, as well as to the Thomas Jefferson Memorial, was purposefully done to highlight the impact all three men had on defining equality in United States’ history; from the proclamation that “all men are created equal,” to the emancipation of the slaves, to the Civil Rights Movement. The King Memorial was dedicated in August of 2011, exactly 48 years after the 1963 March on Washington for Jobs and Freedom, a pivotal moment in the Civil Rights Movement during which Dr. King gave his famous I Have a Dream speech. Ongoing Programs & Education: Park rangers are available between the hours of 9:30am and 10:00pm to answer visitors’ questions. The Martin Luther King Jr. Memorial is frequently the site of ranger talks. Upcoming talks which meet at the statue include Herring and Shad: Keystone Fish Species about the fish who migrate to the tidal basin in front of the statue each year to lay their eggs, and Leadership for Freedom: Dr. Martin Luther King Jr. about the difficult political decisions King made during the struggle for Civil Rights. What’s Nearby: Visitors to the King Memorial would be interested in seeing other nearby memorials of the National Mall, including the Lincoln Memorial, where Dr. King gave his famous “I Have a Dream” speech. Other memorials surrounding the tidal basin include the Franklin Delano Roosevelt Memorial and the Thomas Jefferson Memorial. Back to: Best Things to Do in Washington, D.C.